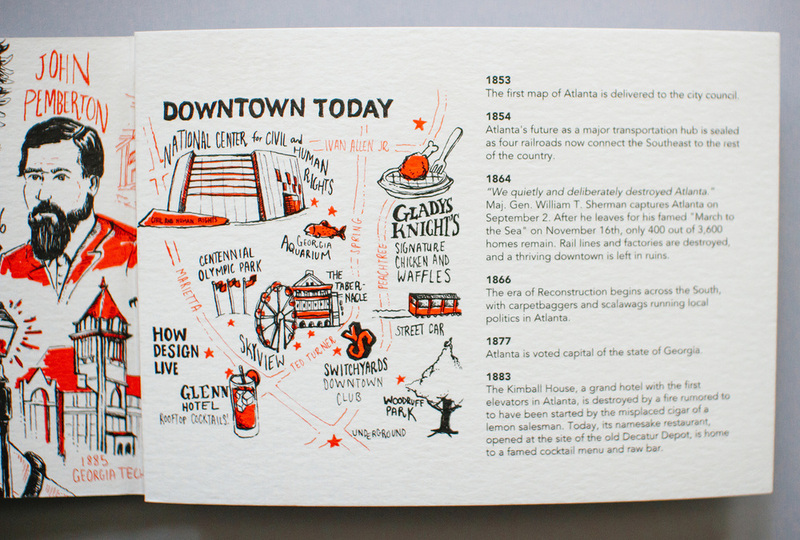 Neenah Paper's continuing series of hand-drawn and hand-lettered illustrated city guides for design conferences: Atlanta, the Big Peach, neighborhood maps and illustrated timeline showing the history of the city. This project was designed and illustrated by freelance artist Russell Shaw for the HOW Design Live 2016 promotion. 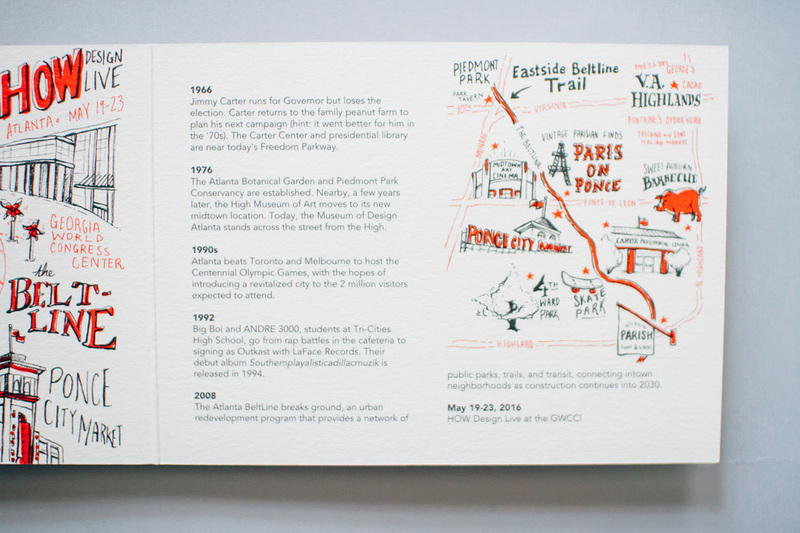 An illustrated history of the Empire State of the South – Neenah Paper's Illustrated Timeline and Map of Atlanta for HOW Design Live 2016. 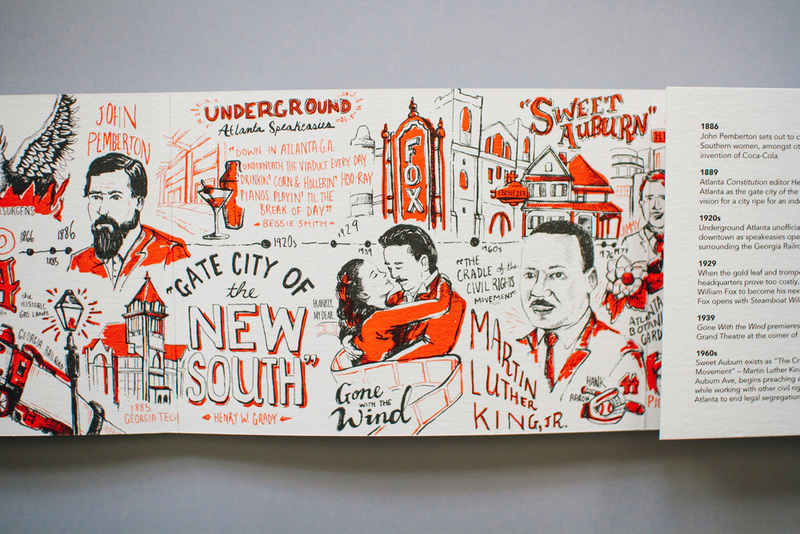 Following the New Orleans with Neenah illustrated maps for use at the 2015 AIGA Conference, Neenah Paper commissioned another illustration in the series for their next conference: HOW Design Live 2016 in Atlanta. This rolling fold, printed piece takes the reader through the past and present of the Big Peach. As each panel is opened, an immersive, illustrated timeline of the history of the city is revealed, with the corresponding panel opposite the timeline detailing dates and events and featuring a map highlighting how that area has changed from then to today. 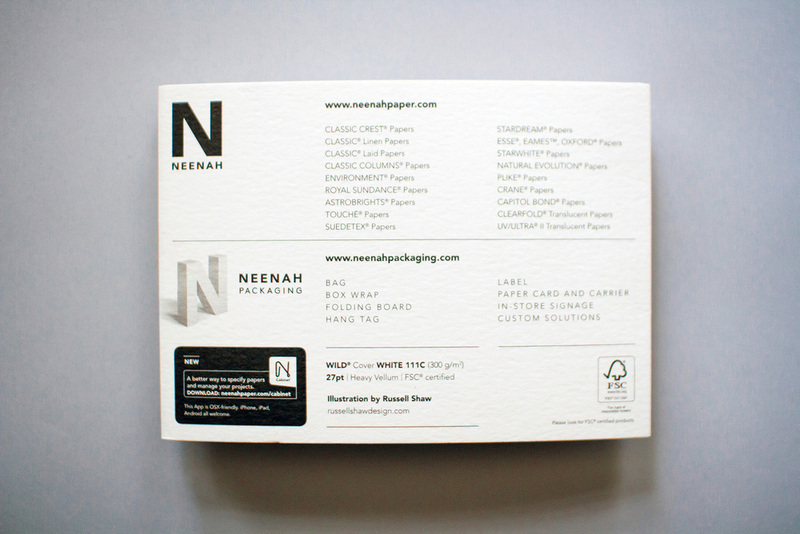 The WILD® Cover paper's rich texture but bright white finish made the two-color print (a brilliant red accent with black linework) really stand out. This project was awarded "Best in Class" in Handlettering in PRINT Magazine's 2017 Typography & Lettering Annual.